Although Tiree is best known for its incredible range and abundance of birds, its rich habitats are also home to a wide range of other wildlife from rare bumblebees to huge Basking Sharks. In order to observe the full range of these fascinating animals, it is useful to become familiar with the dates and places that they are most often seen. 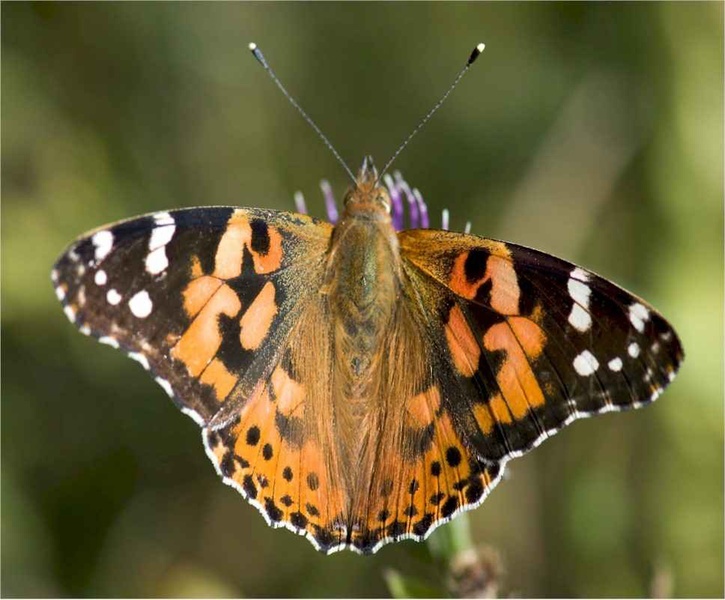 Islands are rather windy places for butterflies, but on calmer sunny days in summer, the flower-rich meadows can come alive with these fragile wanderers. Widespread species such as Green-veined White, Small Tortoiseshell and Meadow Brown occur in all the grasslands for most of the summer but you will need to check the dunes and machairs in July for the dazzling Common Blue. In some summers, large numbers of Painted Ladies and Red Admirals arrive from further south. 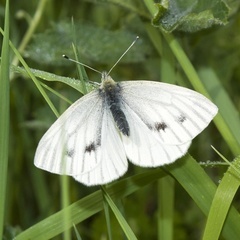 These are joined by Large Whites in June/July and more rarely by Peacock butterflies. As summers warm up, we may see more of these and other butterflies arriving as their ranges spread northwards. Tiree is home to a small range of dragonflies that haunt the wetlands. 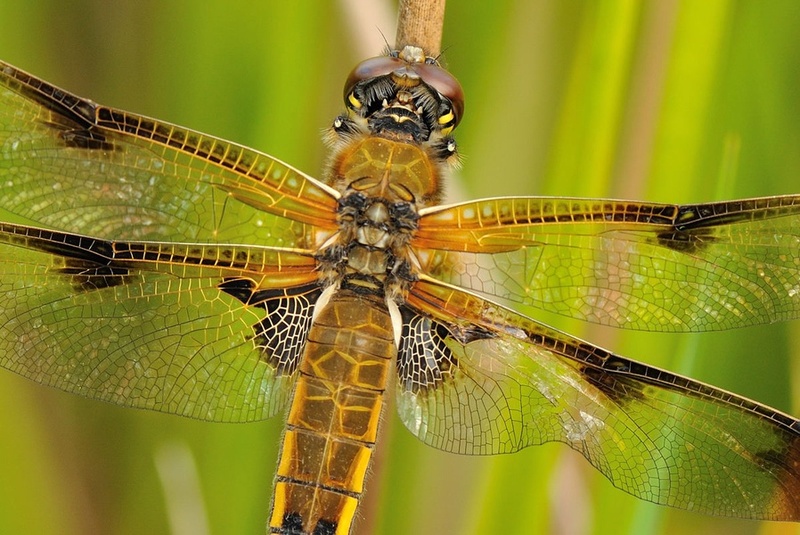 The Four-spotted Chaser is the first on the wing in late May and June – it prefers more acidic moorland pools such as those near the Ringing Stone. Highland and Black Darters follow in July and August – these species are more widespread and their feeding ranges include drier dunes, machair and gardens, as well as loch edges and marshes. The Blue-tailed Damselfly is widespread and common across the island, but the all-blue Common Blue Damselfly does not live up to its name, being more restricted to the edges of the larger lochs. 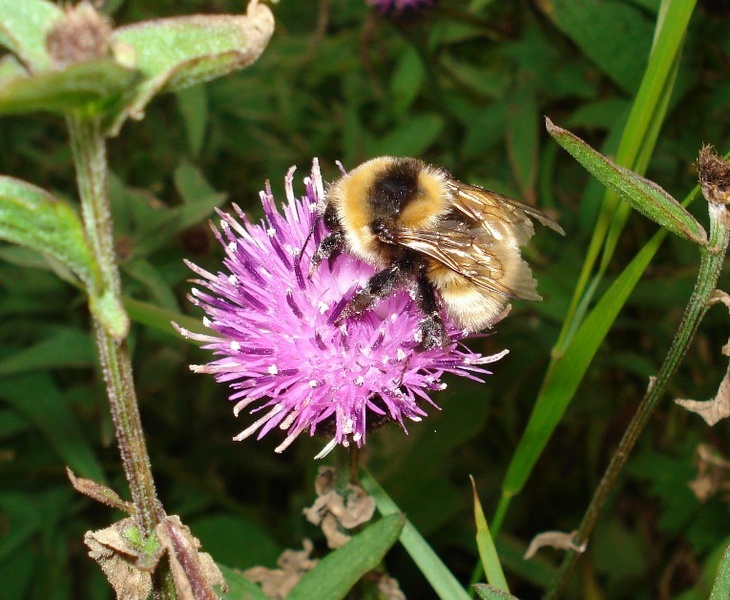 A total of nine species of bumblebee thrive on the flower-rich pastures of Tiree. The low intensity crofting agriculture suits bumblebees very well and Tiree boasts high densities of bees in July and August that are now scarce across much of the mainland. 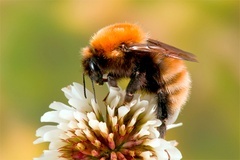 One of the most widespread bees is the Moss Carder Bee, which with its bright orange upper body and yellowish lower body, is a striking sight. This should not be confused with the scarce Great Yellow Bumblebee, which is all pale yellow with a broad black band across it upper body, and is more restricted to the machair. Another common bumblebee seen on Tiree is the Common Carder Bee. Barbut's Cuckoo Bumblebee can also be seen. Two species of red-tailed bumblebee occur - Red Tailed Bumblebee and the Red-shanked Carder Bee - both have all black bodies and red bottoms and are hard to tell apart. Similarly, there are three species of confusingly similar white-tailed bumblebees - White Tailed Bumblebee, Garden Bumblebee and Heath Bumblebe. All of them play a vital role in pollinating the myriad of flowers on the island. The most obvious land mammal is the Brown Hare, which occurs in large numbers all over the island. Tiree remains the largest Rabbit-free island in Britain. Beware young Hares, which can look rather rabbit-like but always lack the latter’s distinctive fluffy white tail. Hedgehogs were introduced to the island in recent years, but do not seem to reach the high densities here that they did on the Uists. 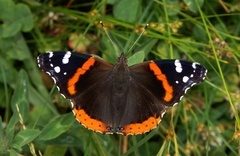 They are most easily seen crossing roads at night on warm late summer evenings. Other mammals present include the Brown Rat, Field Mouse and the Pygmy Shrew, although all are rather elusive and rarely seen. There are occasional reports of bats on still summer evenings, but it is currently unclear which species are involved. 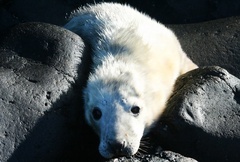 Grey Seals are numerous around the coast and are easily seen on skerries from the road-end at West Hynish or by taking a boat trip out to one of the many offshore islets. 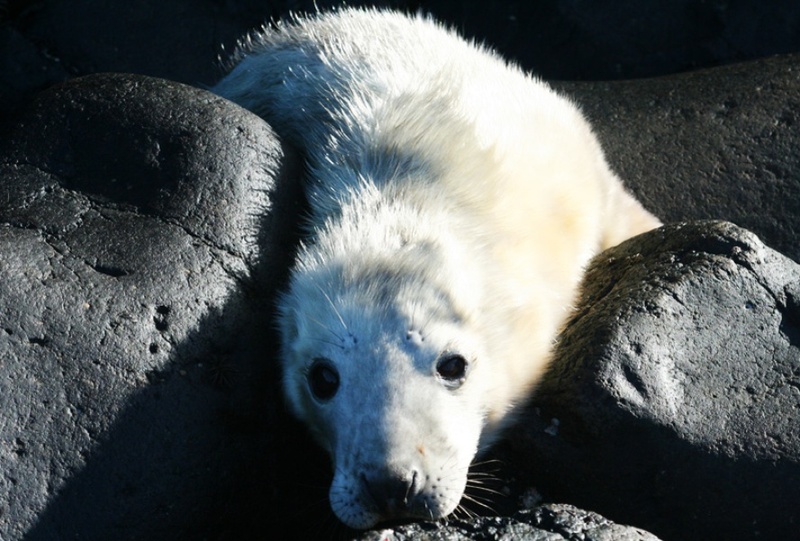 Smaller numbers can be seen in other bays, whilst Common Seals prefer the calmer waters of the bays at Vaul and Salum, as well as in Gunna Sound. Beware however, as the two species can often occur side by side and can be easily confused. The “roman nose” of the large bull Grey Seals is a distinctive feature to look out for. Often regarded as a sea mammal, the Otter is equally at home in the island’s lochs and ditches. Tiree holds a good number of otters, and their tracks are often to be seen on sandy beaches at the base of sand-dunes. Seeing the animals themselves is a matter of persistence and luck. Try the public hide at Loch Bhasapol – Otters can often be seen fishing for eels out in the middle of the loch – although often all that can be seen is the tail as they dive down from the surface. The shallow seas around the islands provide rich feeding grounds in summer. Basking Sharks have become increasingly numerous in recent years and are returning earlier and earlier each year. In 2006, peak numbers occurred in June/July, whereas in previous years the peak occurred in August. Tell-tale shark fins can be circling the island on calmer days from many places, but recent hot-spots have included West Hynish/Traigh Bhi, Hynish Bay from Hynish, Balemartine and Crossapol, and Gunna Sound from Caoles. Also watch out for these gentle giants from the CalMac ferry between Coll and Tiree. The ferry is also the best way of seeing cetaceans. 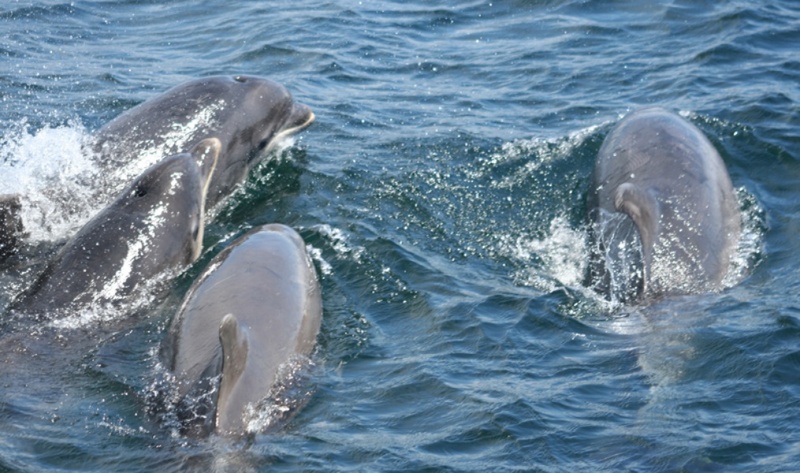 Harbour Porpoises are the commonest cetacean and can be seen year-round, although numbers peak during the summer. Common Dolphins can turn up in large numbers, often in May/June, whilst the odd resident Bottle-nosed Dolphin can be seen with luck. Minke Whales prefer the deeper waters off SW Coll and at the entrance to the sound of Mull, whereas Killer Whales and larger dolphins such as Risso’s, White-beaked and White-sided Dolphins pass through from time to time on their way to and from the Minch, particularly in late summer.